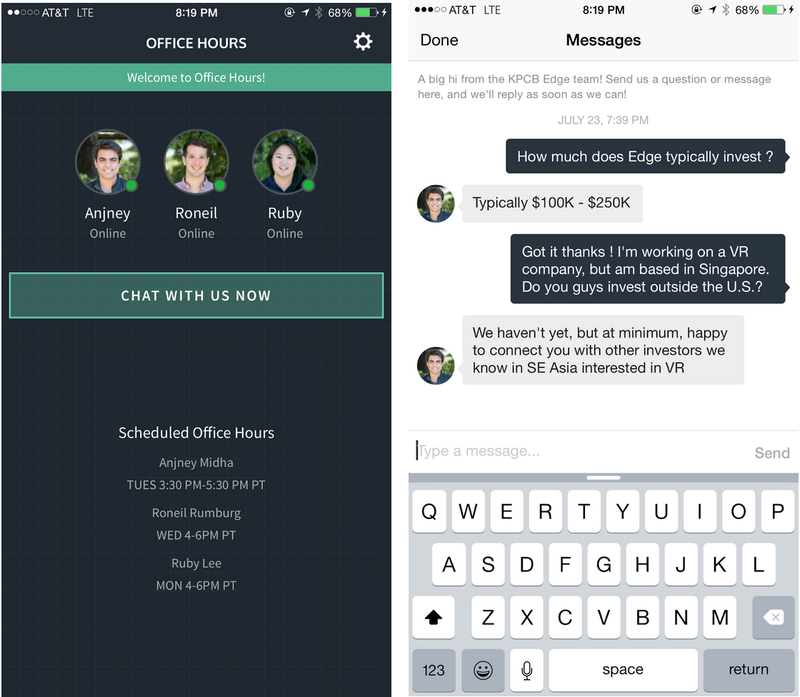 Office Hours is a simple private messaging app. You can use it to have a direct conversation with the Edge partners. Each of the partners spends two continuous hours a week on Office Hours, and we respond to messages received outside of these times throughout the week. For now, it’s an iOS-only client which uses the SupportKit SDK and Slack. Warm introductions are overrated — While we love being introduced to friends of friends who are founders, restricting access to capital based on networks can actually create adverse selection, rewarding schmoozing more than substance. Founders shouldn’t have to know a VC to get to a VC, or have to set up a coffee chat to get a simple answer to a question about term sheets or financing. Whether you’re a founder in Mountain View, Mumbai, Nairobi, or São Paulo — if you open the app during an office hours session, you know we’re there on the other side. Inboxes are rate limiters — Traditionally, most conversations between VCs and operators inside companies like engineers, designers, and product managers get routed through the CEO. This usually leads to a two- or three-step introduction process, before a partner can help out with a simple introduction request, a question about third party tools, or just a friendly debate about tech. We launched Office Hours within our portfolio a few weeks ago, and continue to use it as a way to talk to the amazing people building the companies we back. Office hours are special — Office hours played an important role in our technical educations during our years at Stanford, where we met each other. It’s a space where someone with the ability to fill your gaps in knowledge or help with you with a question opens their personal time up to the community, allowing anyone with the initiative and desire to learn to do so, with few reservations or judgement. We wanted to mirror this in the app, which is why we chose to begin with a private, single channel messaging experience, where any founder can ask a question knowing that the interaction is personal and not broadcasted. We’re excited about the ideas we have to grow Office Hours, like adding group discussions, guest office hour sessions, and topic-oriented channels. We’re also going to open source our codebase, so anyone can see how we built the current version. We’ll likely do this after making the source code more robust as we identify bugs and issues with help from our users. You can download Office Hours from the iOS App Store today and send us feedback by starting a conversation in the app.